Kids love to learn cvc (consonant-vowel-consonant) words! These cvc word cards come in bright pretty colors. You can use them for practice during center times, posted on your walls, or used in pocket charts. Each set of short vowel words comes with an identifying card (for example, “-ab words”) and all the kid appropriate words that end with the same two letters. Two to six pages per set. 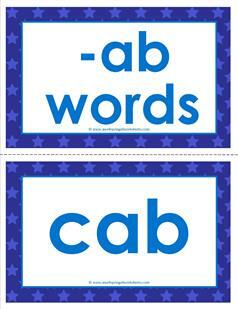 These deep blue cvc word cards -ab words have all the words in the -ab word family: cab, dab, gab, jab, lab, nab, and tab. This blue word card set has 4 pages with two cards per page. 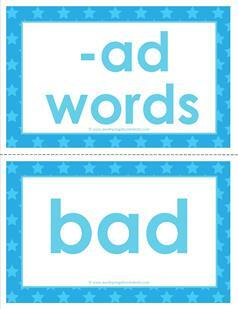 Bright blue cvc word cards -ad words with all the words in the -ad word family: bad, cad, dad, fad, had, lad, mad, pad, sad, and tad. This set has 6 pages with two word cards per page. 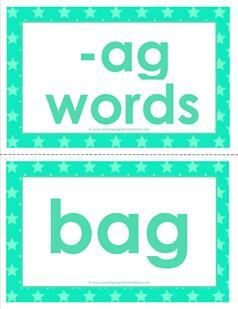 These lighter blue cvc word cards -ag words have all the words in the -ag word family: bag, gag, hag, lag, nag, rag, sag, tag, and wag. This set has five pages with two words per page. 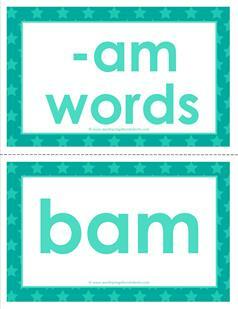 Teal blue cvc word cards of -am words with all the words in the -am word family: bam, dam, ham, jam, Pam, ram, Sam, and yam. This set has five pages with two words per page. Enjoy! Bright green cvc word cards of -an words with all the words in the -an word family: ban, can, Dan, fan, Jan, man, Nan, pan, ran, tan, van. This set has six pages with two words per page. 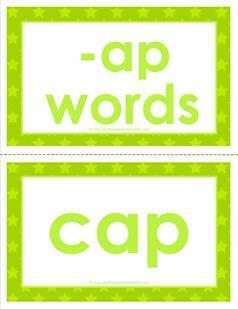 Light green cvc word cards of -ap words with all the words in the -ap word family: cap, gap, lap, map, nap, rap, sap, tap, and zap. This set has five pages with two words per page. 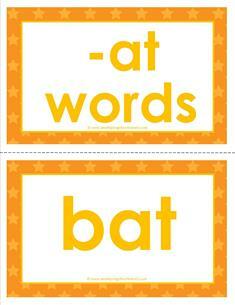 Orange cvc word cards of -at words with all the words in the -at word family: bat, cat, fat, hat, mat, Pat, rat, sat, and vat. This word card set has five pages with two words per page. Orange cvc word cards of -ed words with all the words in the -ed word family: bed, fed, led, Ned, red, Ted, and wed. This set of word cards includes four pages with two words per page. 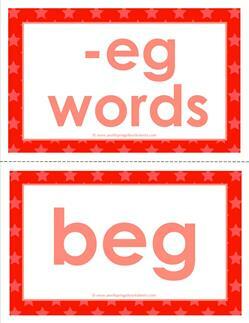 Red-orange cvc word cards of -eg words with all the words in the -eg word family: beg, leg, Meg, and peg. This set of word cards includes three pages with two words per page. Pink cvc word cards of -en words with all the words in the -en word family: Ben, den, hen, Jen, Ken, Len, men, pen, ten, yen, and Zen. This set has six pages, two words per page. Hot pink cvc word cards of -et words with all the words in the -et word family: bet, get, jet, let, met, net, pet, set, vet, wet, and yet. This word card set has six pages, two words per page. 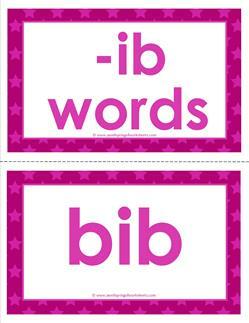 Dark pink cvc word cards of -ib words with all the words in the -ib word family: bib, fib, and rib. This word card set has two pages with two words per page. 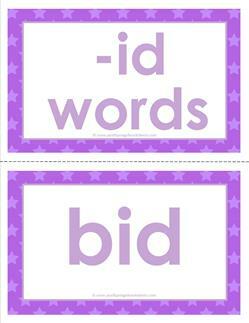 Lavender cvc word cards of -id words with all the words in the -id word family: bid, did, hid, kid, lid, and rid. This word card set has four pages with two words per page. 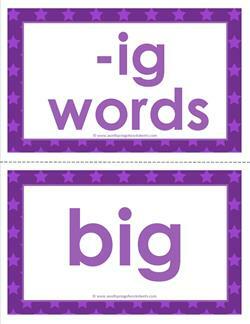 Purple cvc word cards of -ig words with all the words in the -ig word family: big, dig, fig, gig, jig, pig, rig, and wig. This word card set has five pages with two words per page. Deep blue cvc word cards of -im words with all the words in the -im word family: dim, him, Jim, Kim, rim, and Tim . This word card set has four pages with two words per page. Bright blue cvc word cards of -in words with all the words in the -in word family: bin, fin, kin, pin, sin, tin, and win. This word card set has four pages with two words per page. 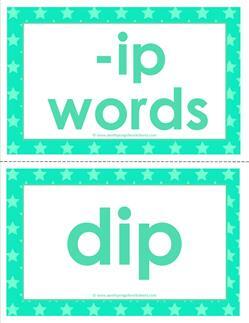 Light blue cvc word cards of -ip words with all the words in the -ip word family: dip, hip, lip, rip, sip, tip, yip, and zip. This word card set has five pages with two words per page. 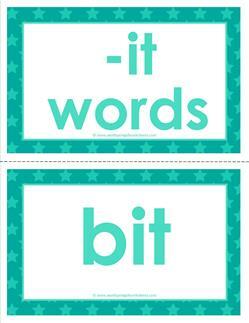 Teal cvc word cards of -it words with all the words in the -it word family: bit, fit, hit, kit, lit, pit, sit, wit, and zit. This word card set has five pages with two words per page. Green cvc word cards of -ob words with all the words in the -ob word family: Bob, cob, gob, job, lob, mob, rob, and sob. This word card set has five pages with two words per page. Light green cvc word cards of -od words with all the words in the -od word family: cod, God, nod, pod, rod, sod. This word card set has four pages with two words per page. Yellow cvc word cards of -og words with all the words in the -og word family: bog, cog, dog, fog, hog, jog, log. This word card set has four pages with two words per page. Light orange cvc word cards of -on words with all the words in the -on word family: Don, Jon, Ron. This word card set has three pages with two words per page. Orange cvc word cards of -op words with all the words in the -op word family: bop, cop, hop, lop, mop, pop, top. This word card set has four pages with two words per page. 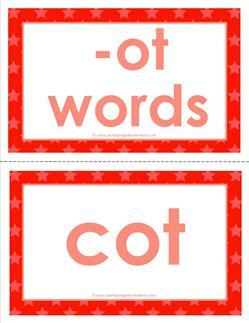 Red cvc word cards of -ot words with all the words in the -ot word family: cot, dot, got, hot, jot, lot, not, pot, rot, tot. This word card set has six pages with two words per page. Pink cvc word cards of -ub words with all the words in the -ub word family: cub, hub, nub, rub, sub, tub. This word card set has four pages with two words per page. Pink cvc word cards of -ud words with all the words in the -ud word family: bud, cud, dud, and mud. This word card set has three pages with two words per page. Dark pink cvc word cards of -ug words with all the words in the -ug word family: bug, dug, hug, jug, lug, mug, pug, rug and tug. This word card set has 5 pages with two words per page. Blue cvc word cards of -um words with all the words in the -um word family: bum, gum, hum, mum, sum, and yum. This word card set has four pages with two words per page. Bright blue cvc word cards of -un words with all the words in the -un word family: bun, fun, gun, nun, pun, run, and sun. This word card set has four pages with two words per page. 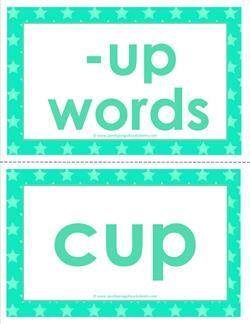 Light blue cvc word cards of -up words with all the words in the -up word family: cup and pup. This word card set has two pages with two words per page. Teal blue cvc word cards of -us words with all the words in the -us word family: bus and Gus. This word card set has two pages with two words per page. Green cvc word cards of -ut words with all the words in the -ut word family: but, cut, gut, hut, jut, nut, and rut. This word card set has four pages with two words per page.